100 000 NOK. 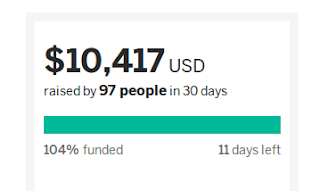 Well, actually 99,287, but I added a few hundred more to get a rounder number. The #MtgForLife campaign gathered well over $12,000 in a little over a month. That is awesome, and it will make a difference. And players from around the world keep the mindset going; just a few days ago Chris Cooper and players in the UK held a charity evening for MSF raising nearly £250. It makes me happy to be a part of the community. All the "thank you"-cards have been shipped btw, so hopefully you have them in the mail by now. I think I've said this every year, but 2015 saw some big growth for mages interested in the origins of the game. Last year I stated that I thought that this blog and the format had grown about as much as was possible, and showed a graph of growth over the last few years. But it's been doubling season yet again, and we're looking at about about twice the number of visitors compared to last year. 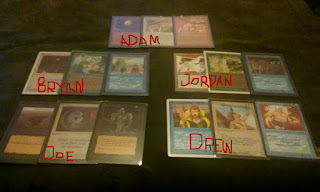 Quite recently I participated in my second 9394 cube draft. 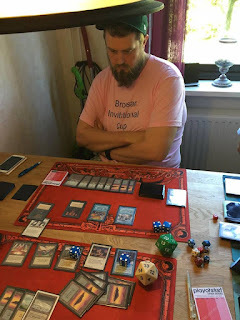 My first time was a few years ago, it was former Swedish Nationals champion Martin Berlin that brought his cube with him before a noobcon. His list was a bit different from "normal" cubes as he had 4 City of Brass and 4 Mishra's Factory, to smooth peoples mana bases and to make Mishra a bit better (like it needs to be better...). He also added a few cards from Fallen Empires to make WW a little better. His list can be found here. 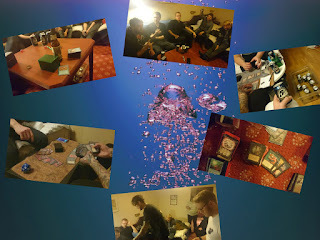 The first witness Games night was at Drew’s house for a second time. Snacks and a 6 pack of sprinkled donuts were provided but never made it out. Poor Joe, he loves a good sprinkled donut. By the way, I had two today and they were magnificent. Bryan arrived early-as per usual. He was wearing his favourite - insert Toronto sports franchise throwback jersey based on season -, in this case it is winter, so he was wearing a Leafs Vintage Jersey Sweater. The only people still reping Leafs gear are B, 11 year olds and Carlos-from Gotham Central Comics-who sells me comics and drives a lunch truck on his off days. Needless to say it was good to see B. While my Channel Universe deck had to take a backseat to spending that budget on #MtgForLife, that didn't mean I didn't brew the last few months. The luxury of having collected a bunch of duals and a majority of the restricted list actually makes building a lot of decks in this format somewhat budget friendly. A couple of months ago I lacked 21 cards for this deck, including 11 Antiquities rares and a pair of Arabian Nights rares, and the whole ordeal still cost me less than a box of Battle for Zendikar. This week I spread my wings and wrote a guest post for Shaman Ben's MtgUnderground blog. If you haven't seen his blog, I highly recommend checking it out. Ben is a fantastic writer and his gonzo-style reports are rare gems in the often bland world of Magic chronicles. The red thread in my article is the second, smaller, 93/94 tournament that took place the day after the Shark tournament at BSK a month ago. It is one of my longer posts, and in my own opinion a good one. You should check it out (and the rest of Ben's blog) here. But that's not all. In case you've already seen the post and feel the need for some netdecking inspiration, here are 24 decks-to-beat from the last months. 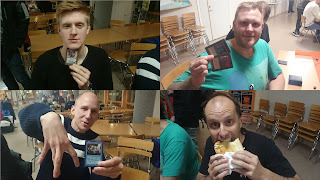 55 participants, photos of 8/8 decks. The sixth showdown at BSK was the grandest one yet. Top decks include e.g. MirrorBall combo, Power Monolith, UR Burn, The Deck and a solid Deadguy Ale. When the dust settled, UR Burn was seen hoisting the Shark once again.